E-Vac Vacuum Generators are a highly efficient, versatile compressed air vacuum pump. Their versatility allows them to be adapted to many applications such as pick and place, clamping or vacuum forming. They’ve also been used in more unique applications like wood veneer pressing and basketball deflation. EXAIR manufactures (3) types of E-Vacs – Low vacuum generators for porous materials, like cardboard, generating up to 21″ Hg with vacuum flows as high as 18.5 SCFM. Our high vacuum generators, designed for use with non-porous materials like glass or steel sheets, produce vacuum levels up to 27″ Hg and up to 15.8 SCFM of vacuum flow. The adjustable generators provide flexible vacuum performance, up to 25″ Hg and 81 SCFM, which can be easily adapted to meet the application. EXAIR E-Vacs provide instantaneous vacuum response, and are engineered for high efficiency to minimize air consumption. Is the material porous or non-porous? This will allow you to select the proper type of vacuum generator to fit the application and the type of vacuum cup best suited for the process. What is the weight of the part and how will it be lifted? If the part is being lifted where the vacuum cups will be positioned horizontally, like on top of a sheet of glass, you want to use a safety factor of 2 times the actual weight of the part. In processes requiring the cups be positioned vertically on the part, such as picking up a sheet of plywood and hanging it on an overhead conveyor, a safety factor of 4 would be used. How many Vacuum Cups do I need? Consider the quantity and placement to evenly distribute the weight for safely moving the material. Depending on the maximum vacuum the generator produce, how much weight can each cup lift? Once you have selected the type and number of cups needed, you can then begin to look at which additional accessories items you might need. Filters – supplying clean, dry air is key for maintaining optimal performance. An automatic drain filter can be used to remove any water or contaminants in the supply line. If there is oil present, consider using an Oil Removal Filter. Mufflers – help to reduce the noise level without restricting the airflow. We offer 2 different styles – Standard and Straight Through. Standards mufflers are a good choice where the supply air is clean and dry. These mufflers can only be used with the porous and non-porous generators. The Straight Through mufflers reduces sound levels by up to 26 dBA and are the better choice in processes where dirt or particulate may be present. Tubing and Fittings – polyurethane tubing is available in 10′ sections up to 50′ for processes requiring the vacuum cups be placed in a location that wouldn’t allow for direct mounting to the NPT vacuum port on the generator or where multiple cups are needed. You want to keep the length of tubing as short as possible though for effective pickup and release time. Check Valve – will maintain vacuum on the load if the supply pressure were to drop or be lost during operation. For additional assistance selecting the proper E-Vac and accessories for your process, please contact an application engineer at 800-903-9247. Temperatures are changing here in the Midwest which means Spring is right around the corner. Basically what that means for Ohio is that it could be close to 70° and sunny one day and 32° with snow flurries the next. For my oldest son and I, the warmer temperatures mean camping and fishing are getting closer (YES!) but it also means that it’s time for the dreaded Spring cleaning and the yard work begins. Having been a little preoccupied with our new family addition, I haven’t had much time to stay on top of keeping things tidy. In fact, my garage looks like the Tasmanian Devil had himself a good ole time (with the help of a certain 7 year old). The sidewalk and back patio both need pressure washed and our storage shed could use some attention as well. Hoping to get a start on these projects in the next few weeks! In industry, keeping a clean work environment can be vital to maintaining a steady production flow. Luckily EXAIR has you covered with our compressed air operated Industrial Housekeeping Products. Requiring no electricity means there are no expensive parts to replace or motors to burn out from the rigors of industrial use. Designed to fit standard steel drums, the units are easy to use and operate. 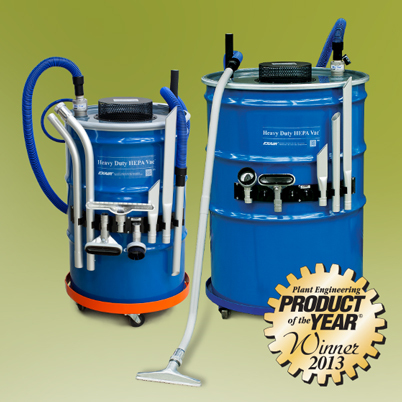 Take for example our Chip Vac System designed to vacuum dry or coolant covered chips or other dry media. Or the Heavy Duty Dry Vac System which is similar to the Chip Vac but features a more powerful vacuum and holds up better to abrasive material (sand, glass, garnet) with its hardened alloy construction. For liquid handling we offer our Reversible Drum Vac Systems that are capable of filling or emptying a 55 gallon drum in 90 seconds. Maybe you have suspended solids in your coolant that need filtered? The Chip Trapper System would be the ideal choice to separate chips from your coolant stream and then return the clean coolant back to the sump. Finally for dusty environments, we offer our Heavy Duty HEPA Vac providing 99.97% filtration at 0.3 micron with it’s HEPA filter to trap dust and fine particles. 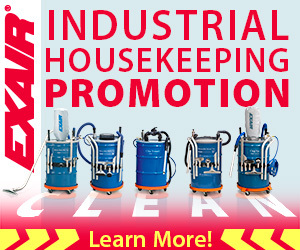 Understanding the need to keep things neat and clean, we are currently offering a free Vac-u-Gun with the purchase of an Industrial Vacuum System through 5/31/16. Order by 5/31/16 to take advantage! If you need any help with selecting the right product for your needs, please don’t hesitate to give us a call. I had noticed somewhat of a trend in my inquiries regarding our Industrial Housekeeping Products of late. It seems that customers want to use our Chip Vac, Heavy Duty Dry Vac or perhaps the Heavy Duty HEPA Vac with a really long vacuum hose. I’m talking like 50 or 60 feet worth of suction hose. And when I ask the customers why they want such a long hose, they say it is so they can reach all parts of their shop from a central location. It did not occur to me until now that folks may not realize that, in fact, all of our Industrial Housekeeping Products are made to be moved around the shop, just like you would an electric shop vacuum with casters. All of our Industrial Housekeeping Products have an industrial drum dolly available for them from the smallest 5 gallon sizes up to the big 110 gallon units. In fact, our Chip Trapper product comes with one included as part of the base system. If you have a need to vacuum debris from multiple locations, moving the Industrial Housekeeping unit around the shop allows you to keep your vacuum hose as short as possible (we have 10 ft. hoses). With this configuration, you do not suffer the line losses associated with trying to create a vacuum across a 60 ft. long vacuum hose which results in lost performance. Dealing with a 10 ft. hose is also a lot less hassle than a much longer one. It is a better idea to use a longer compressed air hose to supply your Industrial Housekeeping Vacuum system with compressed air and roll it around to each area where you need to use it. Compressed air travels through hoses much more readily than vacuum flows do. 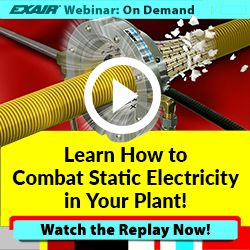 EXAIR has all the necessary accessory items available including Drum Dollies and compressed air hoses to outfit the Industrial Housekeeping Products.